Traditional veggie filled sushi rolls. This is my first time participating in the semi-annual Virtual Vegan Potluck. I couldn’t be more excited to be bringing a sushi appetizer to the party. Sushi and I have a rather short history, which I wish had been longer. For the longest time I wouldn’t try it. I was so afraid of eating raw fish that I shied away from any place that offered it. Then, I went on a date with a guy who suggested we both try sushi together. We happened to order sashimi. It was disastrous. I was terrible with chopsticks and the pieces of fish were so huge I couldn’t even eat them in one bite (hint: I made a mess). Note to self: sashimi is not the best date food, unless your mouth is normal sized because apparently mine isn’t. Needless to say I didn’t really enjoy it all that much (in this case I mean both the sushi and the date – my date kept saying “that’s key” over and over, which I thought was as weird as eating raw fish for the first time). While me and that date never met again, me and sushi did. Fast forward a few months and I met my now fiancee who loved sushi. He took me to a little place near his apartment. As we walked into the near empty restaurant, I noticed a statue of a gold-colored waving cat. I thought to myself “this isn’t going to be good.” We sat, he helped me order and I loved it. It became our new place. As a new vegan, I began to think that sushi was now out of reach. I was sad about losing a newer food that I’d come to love, until I looked up vegan sushi recipes on the internet (I used this post as a reference for making sushi with brown rice). There was more than just plain avocado rolls out there. This vegan sushi roll was inspired by a restaurant I went to while on vacation in San Francisco, CA. It was a Japanese fusion restaurant (with excellent food by the way!). They showed me that vegan sushi doesn’t have to be boring. For the potluck, I’ve included three variations. Citrus topped sushi (my personal favorite). 1- Rinse the rice and then add it to a pot with 2 cups of water. Bring to a boil over medium-high heat, then reduce heat to medium-low and let it simmer for 45 minutes or until all the water is absorbed. Then remove the rice from the heat and take the cover off. Let the rice begin to cool. While it is cooling add the sesame seeds, the sesame oil, and the salt. Mix and then let the rice cool fully. If you are making the mushroom rolls, cook the mushroom now and let it cool also (cook it in one tsp of sesame oil and season with 1/4 tsp of salt, pepper, and garlic powder). 2- When the rice is cooling prep all of the vegetables. Then when the rice is cool set up your sushi rolling area. I used a place mat, which I got from the Christmas Tree shop for $1. It was similar to a sushi mat with wood slats that rolled easily. I just placed parchment over top of it to avoid getting the mat dirty. 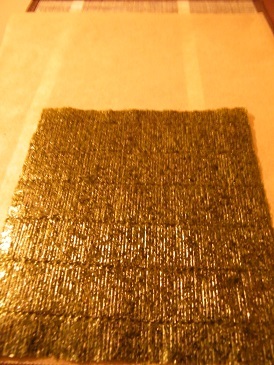 Then I placed 1 sheet of nori on the mat vertically. 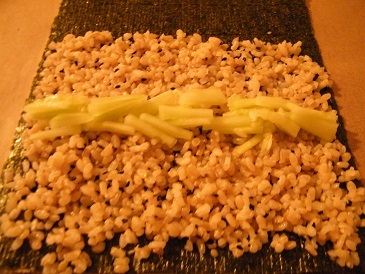 Cover the first 3/4 of the nori with the 1/3 of the rice. Spread evenly on the nori. In the middle of the rice place the veggies of choice (for the veggie roll add cucumber, carrot, and avocado pieces/for the citrus roll add cucumber/ for the mushroom roll add avocado and mushroom) going horizontally across. Use enough so when they are placed the veggies take up 1/2 to 1 inch of space. 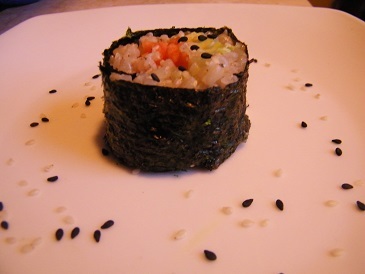 3- From the front of the roll (the end with the rice), pick up the mat and begin rolling it forward. This part is sort of like rolling up a sleeping bag. Continue rolling the sushi until you’ve formed a roll. Cut into 1 inch pieces. *Repeat two more times to make 2 more rolls. 4- For the citrus topped sushi, drizzle a bit of soy sauce on each piece. Then top with an avocado slice and lime zest. For the other rolls serve alongside soy sauce and wasabi. Serve immediately. To get to the next delicious appetizer in the potluck (which is one giant circle of blogging participants) use this link to Eat Pray Bake’s blog. To go back to the last appetizer which came before my post, click this link, which will take you to the appetizer made by Delicious Knowledge. Hehe, no, sushi is not a great date meal – unless you are really comfortable with the other person! I love the idea of putting citrus on top! Beautiful. Thanks so much for joining us! There are ALWAYS issues – just the nature of the beast. Thank you! They weren’t hard to make at all, though I was initially intimidated by making sushi. But even a non-sushi lover loved them. Not bad for my first time! I love vegan sushi! Yours looks great! Yummmy! Sushi is my favorite thing to eat so this looks great! Happy VVP! Yummy, I love sushi! Happy VVP!! I love using brown rice in sushi. I think it adds more flavour. I need a lot more practice rolling sushi, I am sure after trying all the variations, I will have to get better at it. Thank you. I neeeed to make some sushi, STAT! These look so good. I agree! The one with the lime zest was my favorite. Beautiful! I love veggie sushi so much, but rarely eat it. I need to more often. Thank you & fairly healthy too! Wonderful variations on sushi! Thanks for sharing! What a wonderful, healthy recipe perfect for warm weather! Hmmm I love sushi, especially brown rice sushi! You have inspired me to make some for dinner tomorrow! Sushi is definitely not out of reach for vegans! In fact it is one of the most reliable vegan options around I find. Lots of places make really great and interesting sushi. But of course the best sushi is home made so you can get to put whatever you want in the middle! My favourite things to put in mine are Wasabi-fried Eggplant and Tahini Sweet Potato (YUM!). I’ve also made some pretty special Balsamic Strawberry sushi too. All three recipes on my blog, if you’re interested. Nice to meet you at the potluck! That strawberry sushi sounds delicious! I will have to check out those recipes. I still have some nori sheets. Nice to meet you at the potluck as well!